I’ve already had a mini-rant on this issue on Twitter today, but I’m still fired up. Brigid Alverson at Robot 6 wrote that Justice League #1 was available online illegally almost an hour before the print edition went on sale on the east coast. However, you cannot purchase a digital copy of the same comic until 2pm EST today. A little Marketing 101, DC. You do NOT send an email with a clear call to action such as “Buy Now” if your customers cannot buy it immediately! 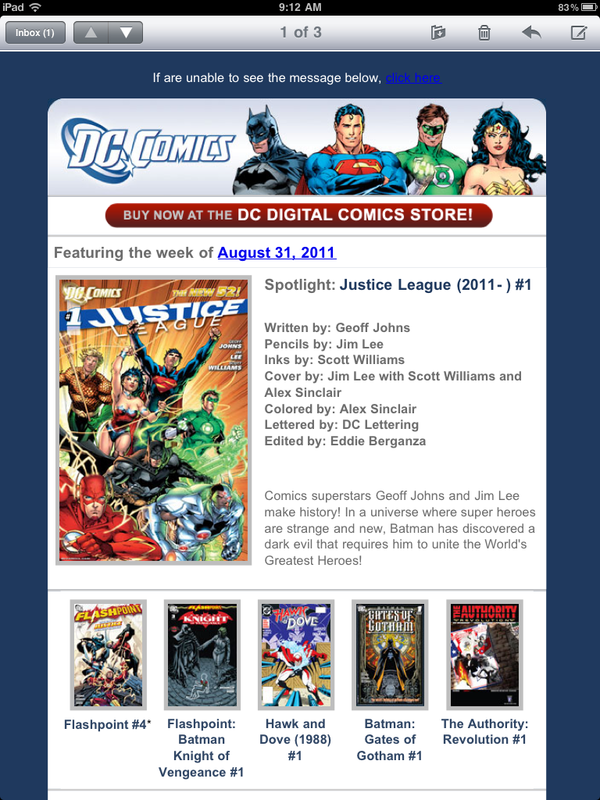 The digital version of Justice League #1 should have been available at midnight. If you wanted to give the midnight launch to the brick-and-mortar retailers, then I’m ok with that, but the digital copy should have been available this morning. DC has spent considerable time and money to build awareness of the The New 52 outside the comics community. They are squandering those efforts by delaying the digital release. Is a non-comics person more likely to walk into a comic shop to pick up Justice League #1 or purchase it through their iPad this morning before they head to work? If you’re going to do digital, dammit, do it right. ← DC tired of turning the other cheek?